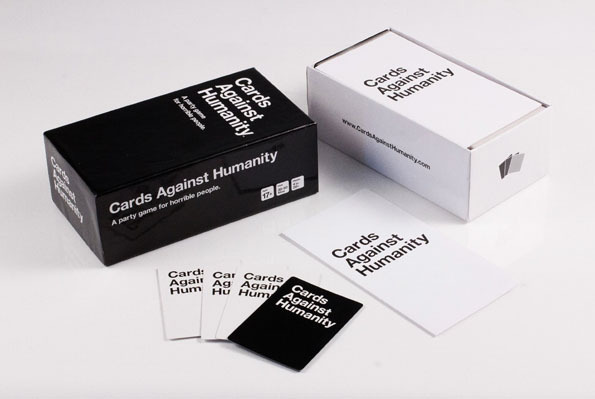 Cards Against Humanity is a party game for horrible people. It is not for the easily offended, the humorless, or the innocent. For $25 you get a set of 550 cards, 460 white and 90 black. Basically one player asks a question from a black card, while the remaining players answer with white cards. Whoever has the most hilarious (which is likely also the most heinous) response wins that round. Rinse and repeat. The game lasts until all the cards are used up or until you can’t even look at each other in the eyes anymore. The second option is far more likely. This game… it uh, it does things. And by “does” I mean “destroy.” In the best way possible.